An igloo in northern Alaska with the beautiful aurora borealis ( Northern Lights ) in the background. 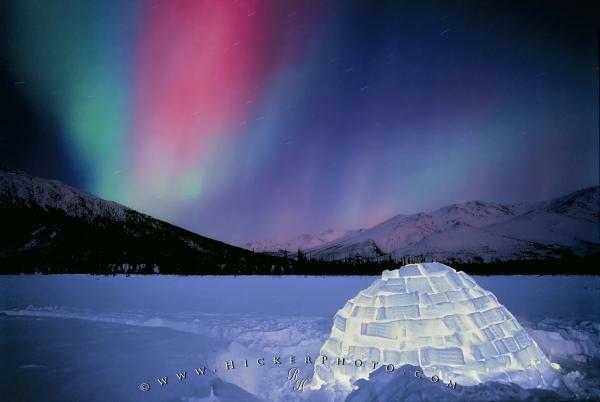 One of my favourite Stock Photos, colorful Aurora Borealis (Northern Lights) is dancing above the Igloo. Solar winds from the Sun interacts with the Earth's magnetic field and atmosphere to produce the incredible beauty of the Aurora Borealis (Northern Lights). There are several Northern Light Tours available in Canada Manitoba and the Yukon Territories as well as in Alaska. Please make sure to see all our pictures of northern lights.